I updated my economic composite following the release of the September employment numbers on Friday, October 5. The gain in non-farm payrolls of 134,000 was short of the consensus forecast of 184,000. However, Hurricane Florence probably weighed temporarily on the employment situation. Temp employment was up 11,000, for an annual increase of 2.9%. This year’s strength in temps continues to provide support to the economic composite's growth forecast. 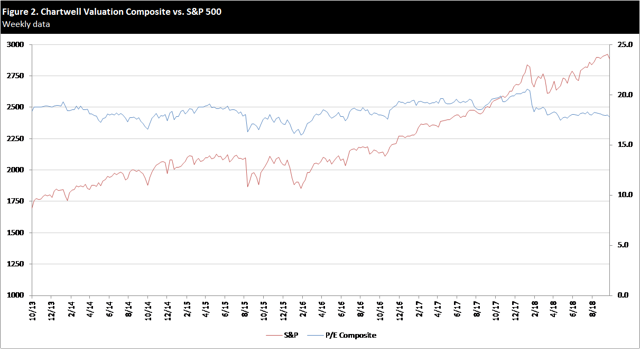 The P/E composite suggests fair value on the S&P. I updated my economic composite to reflect the release of the U.S. Labor Department's employment report on October 5. The report showed a rise in non-farm employment of 134,000 in September. The number was short of expectations. Forecasters were looking for a gain of 184,000, according to Bloomberg News. However, the BLS suggested that Hurricane Florence may have weighed on employment, particularly in the leisure and hospitality sector. Preliminary numbers for the previous two months were revised upward. For the trailing six months, non-farm employment has grown on average a robust 203,000 per month. Temp employment in September was up 11,000 from the previous month and increased 2.9% year over year. Preliminary figures were essentially unchanged. For the last six months, temp employment has risen on average a solid 7,000 per month, for an average increase of 3.2%. It's an encouraging sign that employers are seeing enough strength in their business to hire temps at this pace. As I first noted in early April, they appear to be unconcerned about international trade tensions, despite the headlines. The September increase in temps was ahead of my forecast of 5,000, providing more confidence in my estimates. What’s more, in mid-September, the American Staffing Association released its second quarter data for the temporary employment sector. The report showed that U.S. staffing companies employed an average of 3.20 million temporary and contract workers per week in the quarter, an increase of 2.3% year over year. Sequentially, the figure grew 97,000, which was nearly double my estimate of 50,000. I’m leaving my forecasts for the BLS temps data series and the ASA series unchanged through the end of the year and into 2019. I continue to look for modest monthly sequential increases in the BLS temps data series and a slight annual rise in the ASA series through the next four quarters. As a result, the composite continues to signal economic growth for the next 12 to 18 months. The composite is likely to range from 2.0 to 2.5 through the middle of next year, well into positive territory. I do not expect the economy to tip into recession. The next Employment Situation report is scheduled to be released on Friday, November 2. I expect to provide an update to the economic composite shortly after the report comes out. Figure 1 below shows the actual monthly values of the economic composite from 1991 through the present and the estimated values through the middle of 2020. 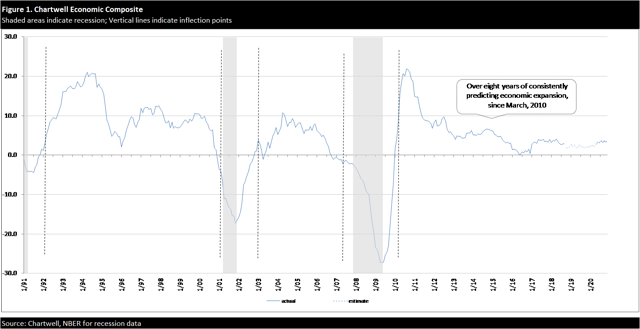 In general, the composite remains positive during periods of economic expansion and turns negative during periods of recession. 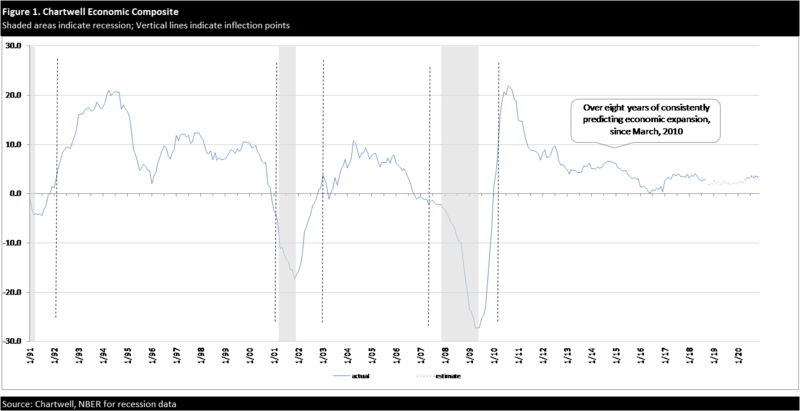 The vertical dashed lines mark the inflection points when the economy is poised to enter recession or has safely exited recession. It typically takes three consecutive months of a change in sign (from positive to negative and vice versa) to confirm a change in outlook. My composite of publicly available forward P/E estimates puts the current forward P/E on the S&P at Friday’s close (October 5) of 2,886 at 17.8. I consider this fair value. The current climate of rising earnings estimates supports a solid outlook for stock prices. S&P earnings continue to come in strong. While still early in the third quarter earnings season, FactSet reported today that, of the 21 companies in the S&P 500 that have reported earnings so far, 18, or roughly 85%, have posted a positive earnings surprise. For the second quarter, 80% of the S&P 500 companies reported a positive earnings surprise. Earnings beats tend to cause analysts to raise their forward earnings estimates, which lowers forward P/Es. I would be a more aggressive buyer at a lower P/E, perhaps around 17.0, which would equate to roughly 2,765 on the S&P. For now, I would continue to make regularly planned dollar-cost averaging allocations to equities that investors intend to hold for the long term, such as monthly or bi-weekly contributions to a 401(k) plan. A five-year chart of the valuation composite and the S&P 500 is below. 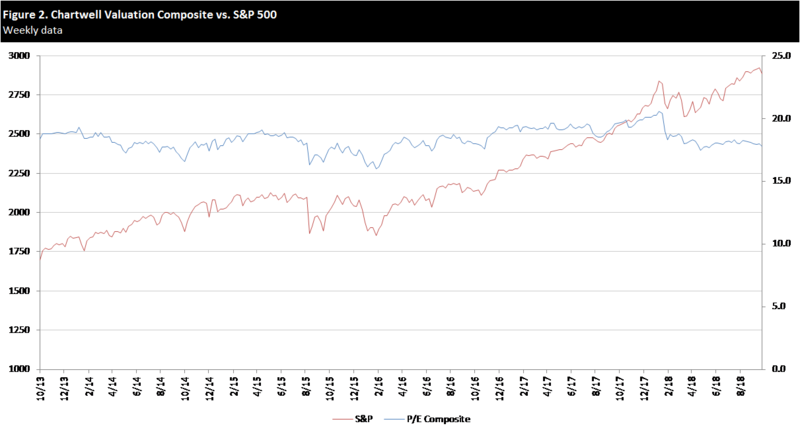 While the S&P has remained relatively flat in the last month, the P/E composite has fallen about 2%, reflecting the increase in the earnings estimate for the index. The model’s historical record is depicted in the chart below. The economic composite predicted the beginning and end of the 2000 recession and the 2008 recession. It also predicted the end of the early 1990s recession. Some of the data series used in the composite did not exist before 1990, hence, the start of the track record at that time. 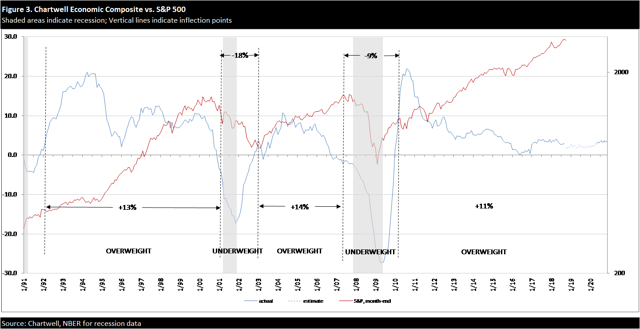 In the two historical Overweight periods, the S&P rose 13% and 14% on an annualized basis. 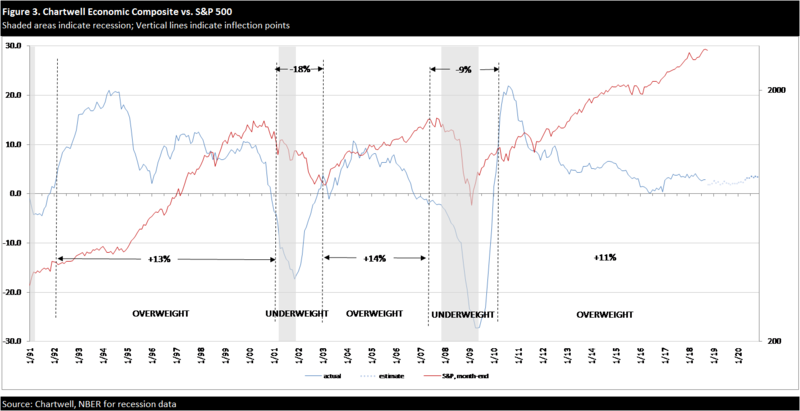 In the two historical Underweight periods, the S&P fell 18% and 9% on an annualized basis. In the current Overweight period, the S&P has been returning 11% annually.